Prominent & Leading Manufacturer from Coimbatore, we offer jowar roti / joleda roti making machine and kadak roti/bajra roti machine. In order to cater diverse requirements of the clients, we offer functionally advanced array of Jowar Roti/ kadak Roti Making Machine. Our entire product range is sturdy in construction and ensures wide applications. 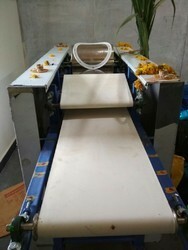 Jowar Roti Making Machine is used to prepare Jowar Roti and is configured with modern technologies.